After a week on the ropes, Fareed Zakaria is back in the game. Yesterday, Time and CNN announced they had cleared Zakeera of any charges of wrongdoing: “We have completed a thorough review of each of Fareed Zakaria’s columns for TIME, and we are entirely satisfied that the language in question in his recent column was an unintentional error and an isolated incident for which he has apologized. We look forward to having Fareed’s thoughtful and important voice back in the magazine with his next column in the issue that comes out on September 7.” CNN, which is a part of the Time Warner media conglomerate, issued a similar statement: "We found nothing that merited continuing the suspension. Zakaria has apologized for a journalistic lapse." Well, that's settled. Who needs accountability in the journalism world when that would just get in the way of Zakaria's important job: Being a dancing circus poodle for warmongers, neoliberals and multinationals. In other words, those who, like Zakaria, escaped accountability for their failures (and their thieving). After a brief vacation, Zakaria will go back to work for Time Warner as one of the very worst, most toxic media shills working today. How bad? Well, a few years back FAIR compiled an exhaustive dossier on some of Fareed's "thoughtful and important" work on economic issues from 1999 to 2008, which they titled: "Fareed Zakaria, Spokesperson for the Global Elite: Newsweek pundit presents pro-corporate views as the poor’s perspective." Here are some of the highlights, courtesy of the good people of FAIR. In his eyes, the Third World’s poor eagerly welcome Western investment on any terms as a vast improvement over their current misery. Microscopic wages, long hours and heartless management in sweatshops, along with befouled air and water, might seem horrific to wealthy Westerners, but are gratefully welcomed by the desperate people of nations like Mexico, China and India. “In fact, if the demonstrators’ demands were met, the effect would be to crush the hopes of much poorer Third World workers,” he declared (12/13/99). Zakaria . . . unfavorably compared Chávez, a democratically elected president, to U.S.-supported Pakistani dictator Pervez Musharraf (Newsweek, 11/19/07): “Musharraf, for all his flaws, has been a far better president than Chávez, who despite Venezuela’s oil bonanza has run the country into the ground.” In reality, Chávez’s popularity and the strength of Venezuelan democracy has consistently been rated among the highest in Latin America (e.g., Latinobarómetro poll, 11/07), and economic conditions in Venezuela have improved markedly, especially for the poor, according to various international reports (CEPR, 3/21/08). Here Zakaria confuses the official “nominal” tax rate with the effective tax rate paid by corporations, which is lowered by enormous tax breaks, putting the U.S. 26th out of 30 among wealthy nations in terms of corporate taxes as a share of GDP. “Eighty-two of America’s largest and most profitable corporations paid no federal income tax in at least one year during the first three years of the George W. Bush administration—a period when federal corporate tax collections fell to their lowest sustained level in six decades,” a Citizens for Tax Justice study found (9/22/04). Zakaria quotes former World Bank official Lawrence Summers to make the claim that Mexico’s NAFTA-driven transformation “didn’t cost the U.S. a penny” (Newsweek, 3/10/08). It is remarkable that Summers, who also worked as secretary of the U.S. Treasury Department, neglected to mention a roughly $25 billion bailout of the Mexican economy in response to the drop of the peso in 1995 (Faux, Global Class War). Further, an Economic Policy Institute briefing paper (9/28/06) estimated that NAFTA has resulted in the loss of over 1 million U.S. jobs to Mexico. Yet Zakaria has nothing but contempt for those who argue that corporate relocations of jobs are driven by the desire to exploit low-wage labor: “There are no serious economists or experts who believe that low wages in Mexico or China or India are the fundamental reason that American factories close down,” Zakaria declared with characteristic certainty (Newsweek, 3/10/08). Want to know more? Read the entire FAIR dossier here: Fareed Zakaria, Spokesperson for the Global Elite . . .
Yasha Levine is co-founder the S.H.A.M.E. 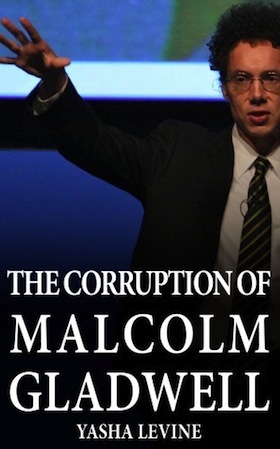 Project and author of The Corruption of Malcolm Gladwell.